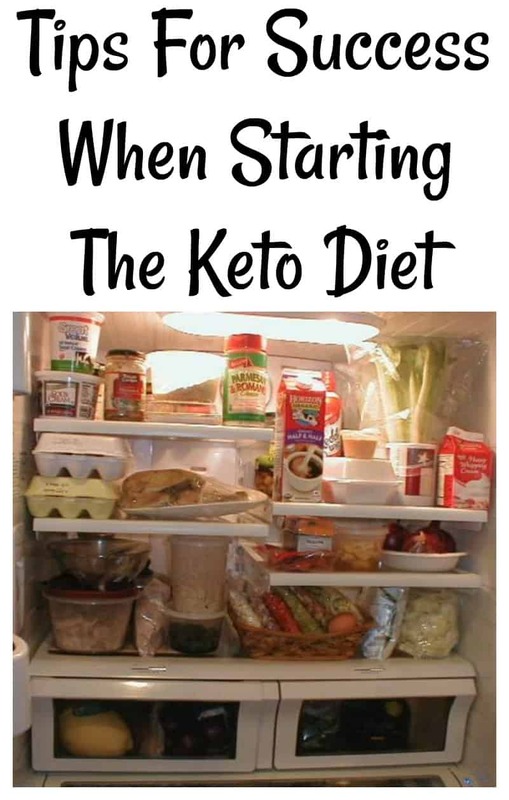 I just have to tell you about our Low Carb Inspirations Facebook group because this is exactly where we got all of these tips for success when starting the Keto diet! Special thanks to Donna L for creating this amazing refernce for all of us. Grab the printable version of this information at the very bottom of this post. Newbies to Low Carb Dieting or new to the Ketogenic Diet… set yourself up for success! There are a few differences for Low Carb vs. the Keto Diet and I will point those out below. Here is a list of my ideas to help you get started. The hardest part of making a salad is searching for and pulling out all the ingredients, and then having to put it all away again. So make a Salad basket for the fridge. Place all these bags into the basket so you can just pull out the basket and its all there and you don’t have to dirty a knife. (I cut them in slices and chopped so I have a choice depending on the meal plan). Make a soup. Heck, all the veggies are already cut, just add meat and spices. When cooled, put single servings into zip lock bags and lay flat in the freezer. They defrost really quick and are a great backup plan when a quick meal is needed or to add with a meal. Make meatloaf and meatballs at the same time and freeze them. Grab a slice or a few Balls for quick meals. (I use crushed pork rinds, grated cheese, and spices) Check out our Keto Cheese Stuffed Meatballs recipe here. Bacon… Cook several lbs of Bacon at a time on cookie sheets in the oven. (Lay bacon close together and bake at 400 for about 10 mins depending on how you like it) Then drain it on paper towels and slip them all into a gallon size freezer bag then freeze. They can be eaten frozen as a snack, or heat in mic for 10 secs. Save the bacon grease for cooking with later. It’s a great way to incorporate extra fat into your diet. It’s yummy too! Hard boiled eggs… Keep them on hand. Good Omega 3 and great to snack on. TIP: Costco sells precooked bacon (50 to a bag) and hardboiled eggs in bulk! Turkey is not just for Holidays. Cook one, debone it, put in ziplock bags, lay flat in freezer. Take out slices as you need them. Add some turkey to your soups! (give the pets the gross parts except for the bones.) They need real food too. Snacks… Make ham and cheese roll-ups, cream cheese stuffed celery sticks and deviled eggs. Put them on a pretty plate as if it was a holiday. Food tastes better when it’s pretty! Be sure to check out our Top 10 Keto Snack Ideas here too! Change the way your fridge looks inside. Move the ‘not worthy’ stuff to a bin and display the low carb things loud and proud! Make sugar free jello and put in pretty little dessert dishes. Just grab and top with REAL whipped cream. I like to eat meals approximately the same time every day. It tells my body not to go into starvation mode and that food is on the way. Now knowing when that time is, whether I’m hungry or not, I can go get my salad made and food prepared before I’m ravenous. This assures I will eat properly. Always make extra when you cook so you can freeze or have for lunch the next day. Butter is your friend so top all your hot veggies, eggs, meats etc. with it. Seriously, I had to train my brain that butter was a good thing. Don’t eat 2 hours before bed. Drink water but don’t go stressing over it. It flushes out nutrients, it stretches your stomach and it should not be with meals because it dilutes your stomach acids which you need to digest all the fat and proteins. Fat is not water soluble so it’s a myth that it flushes out the fat. Drink normal amounts all day (and very little within 2 hours after a meal). Grab this free printable: Keto Sample Menu 7 Day Plan too! Put all The UN-WORTHY foods in a plastic tote in the garage or better yet, give it to a needy friend. It’s harder to cheat if it’s not readily available. If a cheat happens outside of the home it’s much easier to get back on track once your home. Mark LC (Low Carb) foods with black marker on the front of the packages so you can easily see the carb amount without searching for glasses. (Example: 1/4 c = 2 carbs ) and do the same for the Keto Friendly foods too. Plan your menu at least a day in advance and remove from the freezer tomorrow’s meals. Hunting and searching for what you want to eat isn’t any fun when you’re hungry, and waiting for something to defrost is even worse! When you pull out all the cold cuts to make 1 sandwich think ahead. Make several! (no veggies) Then wrap each one in a paper towel, (Paper towel keeps it from getting soggy) place in separate Ziplock bags and stack in the freezer. (Mustard freezes fine but Mayo doesn’t ). Then grab one and go to work, by lunchtime it will defrost and be as fresh as the day it was made. Do you have a somewhat sunny window sill? Lots of herbs can be grown in low sunlight indoors. Fresh herbs not only add a lot of flavor to our meal, they’re also packed with those healthy things they say we need. Re-Grow your green onions. See the process on How to Re-Grow Green Onions here. Scallions as some call them are a tasty garnish and have lots of nutrients. When cutting the scallions, leave the bottom white part and root intact. Use the green part for cooking now and Plant the white part (leaving a little sticking up above the soil) in a small pot on the windowsill and keep it well watered. It will grow again and you get more bang for the buck! Just clip off what you need when cooking. (It will also grow in just a glass of water, but change the water every 2 days). Don’t go to a party hungry. Eat before you go (Unless you know the menu is safe ) and bring a bag of pork rinds for you to enjoy with Dips and cheese platters. With a sharp knife poke a hole into the side of a chicken breast moving knife side to side to create a cavity. Be careful NOT to poke through any of the other sides. Roll a slice of Swiss cheese or a stick of your favorite, then roll a slice of deli ham around the cheese. Stuff this into the cavity of the chicken. Then close the hole with toothpicks. Rub the chicken with bacon grease and coat with crushed pork rinds. Place on crinkled foil and Bake for 30 to 40 mins. till juices run clear. Let rest 10 mins before serving. Top with LC gravy #2 and serve with cauliflower and a side salad. #2 HWC, chicken bouillon, and American cheese. Heat till creamy. Serve over Chicken Cordon Bleu. #3 Stroganoff style … In butter, brown Mushrooms and a little chopped onion, add HWC, and Beef Boullion simmer till hot then take some of the warm liquid and whisk it into a little sour cream then add that back into the gravy and serve over cauliflower and burger or steak slices. #4 Newburg style … HWC, enough tomato paste to color it pink, a splash of Sherry, tarragon, salt and pepper to taste. Heat over low heat and serve over seafood. TIP: Place spoonfuls of left-over Tomato paste on parchment paper or in ice cube trays and freeze. Once frozen drop into a ziplock bag, so you can grab a dollop another time when needed. #5 Sausage and gravy… Brown chopped breakfast sausage in a pan then add HWC and American cheese. Heat till creamy and serve with eggs. #6 Chinese style… In a large skillet with Butter, BROWN 1 lb Ground pork, 1/4 c chopped onion and 1 small can mushrooms (or fresh). Then add fresh chopped garlic (or powder ) Add HWC, (amount depends on how much gravy you want) and low salt soy sauce (still very salty so taste as you add) Simmer to reduce a bit. Serve over Veggies. #1 HWC and Cheeses do have carbs so use just enough gravy to flavor and moisten the meal. #3 Bring a low carb pita in your purse when you go out to lunch. I always ask the waitress if they offer alow-carbb bun for their burgers. I know they don’t but if people keep asking they will eventually carry it. Garlic powder, Onion Powder, parsley, salt, and pepper. The oven is heated so cook a couple of meatballs for a Taste test. Don’t mind if I do! Decide if it needs more spices. If it’s good, divide batch. Put in loaf pan or casserole of choice. Spread a bit more ketchup on top and bake at 350 for about 40 to 50 mins or till the juice runs clear. To freeze: Let cool and lay separate on Freezer paper on cookie sheet and place in Freezer. Once frozen, put them in ziplock bags. Appetizer meatballs: Make Meatballs then roll in a mix of crushed pork rinds and Parm cheese. 1 block cream cheese softened to room temp. Mix top 5 ingredients well and form a ball shape. Refrigerate an hour then roll in the nuts to coat the outside. Serve with pork rinds or on celery. Mash the Liverwurst with mayo and a small squirt of mustard. Mix well and serve with pork rinds or celery. Mix and chill for an hour. Serve as a side with chicken, or with pork rinds or with Kibbeh. While raw, cut diagonal lines making diamond shaped indents. Drizzle a little olive oil over the top and bake at 350 for about 30 mins. Low carb “maple walnut ice cream” DELISH!!! So simple and it only takes about 5 to 10 minutes to make. Put first 4 ingredients into the small bag taste for sweetness and adjust if needed. Seal bag. Fill large bag ½ full of ice and about ¼ cup of kosher salt, shake to mix. Put small bag inside the bag of ice then seal. Using a towel or gloves to protect your hands, start shaking the bag. SHAKE, SHAKE, SHAKE, SHAKE YOUR BOOTY! After about 5 mins or so of shake exercise, YOU HAVE ICE CREAM. Rinse the salt off the small bag before opening. Serve, Eat and enjoy. You can add cocoa powder, nuts or unsweetened chocolate chips, strawberries, etc. to the top 4 ingredients before shaking if you want. I made “maple walnut” by chopping a handful of walnuts and toasting them briefly in a pan then added them to the cream along with some “sugar-free maple syrup”. The amount of cream used doesn’t matter, just taste and adjust the flavor to your liking. If you have kids, each can have their own little bag and have a family shake party. It’s much cheaper than buying ice cream, no fillers and low carb. Add vinegar to your higher carb salad dressings. It will add flavor and thin it down so you’ll use less. TIP: Crinkle up aluminum foil then gently open it flat leaving peaks and points in the foil. Place pork rind breaded meats or fish on top of the peaks for cooking. This keeps them above the juices and stops them from getting soggy. I have 3 eggs every morning with sausage, Bacon or Ham. Salad pockets….Cut up deli meats and feta cheese mixed with chopped lettuce and salad dressing. Cut a low carb flax pita in half and stuff both halves with salad. (If you are bringing this to work keep bread and dressing separate till ready to eat). Lay a slice or 2 of each Genoa salami, cooked ham, sandwich pepperoni and provolone cheese. Add thinly chopped onion, chopped lettuce and “Wickles Hoagie and Sub relish” (it’s hot and spicy, I get it at Lowes foods) Then roll up and serve with a dill pickle. Tuna salad, egg salad, Ham n cheese etc. Pizza: Take a low carb pita and top with Tomato sauce, provolone or mozzarella. Pepperoni, onions, mushrooms or peppers. Put in the oven at 400 degrees for about 8 to 10 mins. serve with salad. Or make this Low Carb Keto Friendly Pizza recipe. You can make the dough ahead of time and freeze it as needed. I tend to make 6 pizza dough recipes ahead of time and freeze the dough before I bake it. It thaws in about 20 minutes and makes life super easy when you’ve had a busy day. Top veggies with butter and parm cheese. serve over cooked chicken and zoodles. Buffalo chicken… Mix franks red hot sauce with butter and garlic powder and put in the mic for 10 secs. put over cooked chicken and serve with salad, celery sticks and dressing of choice. Crushed pork rinds, (crush with a rolling pin or a cup or in a food processor) Mix spices into the pork rinds such as sage, poultry seasoning, garlic and onion powder. Rub the chops all over with Bacon grease and coat with the pork rinds on all sides. Fried chicken .. yes u guessed it, coat with bacon grease and crushed pork rinds. Bake or fry it’s your call. serve with yup… side salad and LC veggie with Butter. gravy? Heavy cream with chicken bouillon. (spices of choice optional). simmer on low to reduce and thicken. Serve over the chops or chicken. Bake at 350 for 1 hour. (till juices run clear) remove from oven and cover, let rest 15 to 20 mins before cutting. Slice and freeze leftovers for quick meals. With the other half of the mix, make the meatballs! place on a cookie sheet into the oven with the meatloaf. These will cook for 20 mins. check for doneness. cover and let cool before freezing in a ziplock bag. Roll up, top with Frank’s hot sauce if desired, cover and place in mic for about 2 mins. Then top with a little salsa, lettuce, sour cream and …Guacamole… I buy single-serve pouches at Wal-Mart and freeze them. When I want one I drop it into a glass of warm water and it defrosts in 5 mins. steak topped with butter and salad – Need I say more? Cheesy Bacon Burger or Butter Burgers on salad. Hot dogs with low sugar ketchup (not keto friendly) or mustard. Large roasts go a long way. Pot roast, pork roast, whole chicken, Turkey. Make on Sunday and munch all week or freeze in convenient size portions. I tend to bbq meats on Sunday for this reason too! Russell Stover’s sugar-free candy…. I know you’re looking for sweet but tread lightly with these because they will cause you to soil your pants. 1 sugar-free candy you’re safe, 2 your playing with the devil, 3 or 4 the Devil wins! Just warning you! Strawberries are pretty low and healthier, top some with whipped cream and enjoy. If you miss milk, try almond milk or coconut milk or even some heavy cream mixed with water to a milk-like thickness. It’s great. Make a smoothie with heavy cream and fresh or frozen strawberries in a blender add water to adjust thickness. ( don’t overdo it ) Hello, Sugar Free Passion Tea Latte recipe! Don’t have more than 1 Low Carb bread/pita/wrap serving in a day. In the beginning, you will look for anything and everything that resembles the high carb foods that got us fat to begin with. But the reality is, If you want to lose weight FAST, foods like fats, meats, and salads will get you there. Keep your meals as simple as you can, It doesn’t get any easier than meat and veggies! Atkin’s website gives a FREE starter kit with a carb counter book and some candy bars. Just sign up and you will have it in the mail in a few days. (no free candy if you opt for the download version). Good Luck, we’re in this together!! Y’all head over to the Low Carb Inspirations Group (request an invite) and thank Donna L for all these wonderful tips she has shared with us! Her knowledge has been valuable to so many of us and we are extremely grateful she has shared it with us! Thank You, Donna! You can thank Donna on this original post thread here once you are accepted into the group. If you need a free meal plan to get you started you can print the Keto Sample Menu 7 Day Plan here. By Jennifer on September 26, 2017 Keto Friendly Recipes, Ketogenic Diet. Thank you so much for simplifying the process with great tips and recipes. Thanks so much for putting this together. Some really great advice for beginners here. I love the look of your butter burgers, I will be giving that a try real soon. Love your tips and recipes! Thank you so much! This is sooo fantastic! It will make this way of eating much simpler. I hope you realize the impact that taking the time to put this together will have on so many lives.